Claire Chesnier’s work draws from the modern and contemporary abstract tradition as well as from the experiments of the French Impressionists during the second half of the 19th century. As the artist herself states when talking about her artistic practice, in her work colour is not a given, it arrives. This very succinct statement points to two fundamental features in Claire Chesnier’s body of work —on the one hand, it regards time as a key element in her creative process which, very briefly, consists on applying a number layers of watered ink on a thick sheet of paper and, on the other, it refers to a dialogue with the gesture of the colour itself, that is, an internal rhythm that guides the appearance of a certain tonality. Chesnier’s work has a special quality akin to those manual, laborious and slow paced traditional techniques that allow the artist to develop a deep relation with the medium and the tools she makes use of. The coloured shape suspended into the white space is an attempt to circumscribe the excess of the medium —it creates a tension between the very sharp borders of the shape’s cut out and the infinite transparencies that conform the thickly coloured surface. 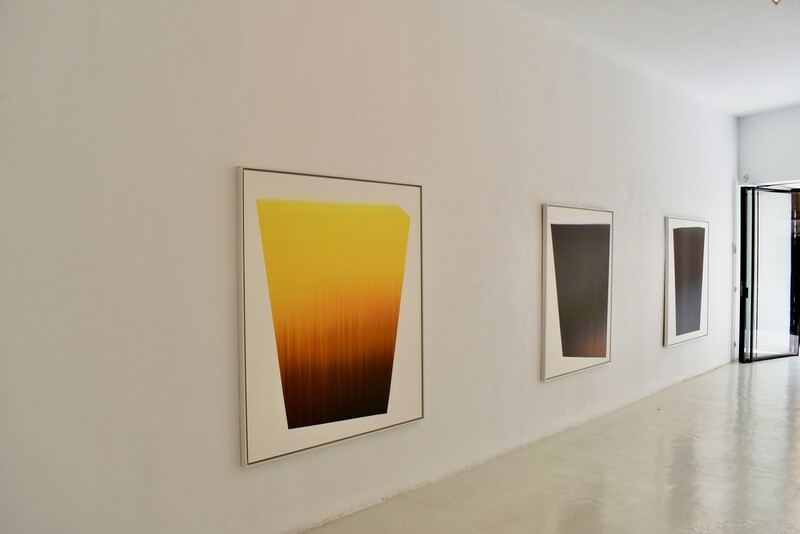 The formal cohesion that is so clearly recognisable all over her work is the manifestation of a methodology and a clear line of investigation that enable her to delve into the material and immaterial qualities of light and colour. Claire Chesnier’s work draws from the modern and contemporary abstract tradition as well as from the experiments of the French Impressionists during the second half of the 19th century. And even further back because Claire is concerned with what is dearest to painters of all times, that is, light and its manifestation through colour. In her case, light comes naturally from within the painting, it is imbued in colour and flows all over the surface becoming more intense in areas with less layers of ink. The veils she so masterfully creates produce beautiful degradés that not only allow light to break through but also create the optical illusion of a non-representational abstract space. The ethereal quality of these chromatic landscapes contrasts markedly with the kind of bodily experience the artist seeks to produce. 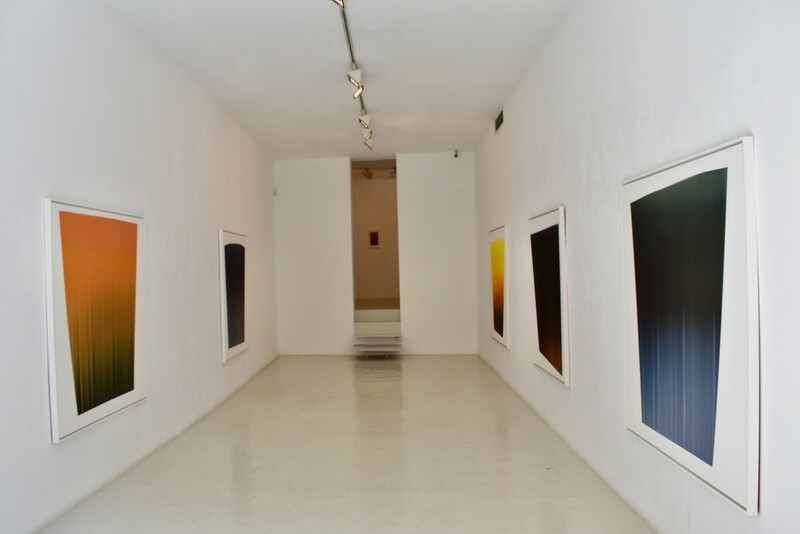 This is indeed one of the reasons why she hangs the pieces rather low —to facilitate a direct encounter with the paintings and to enable the visitor to experience at eye level the details and light fluctuations of her colour fields. Claire’s paintings swiftly captures our attention by depicting harmonious tonalities where darker and lighter areas gently coexist creating balanced compositions that bear a special kind of resonance. Claire’s polyhedral forms respond to a logic that originates in the artist’s relation with the support. 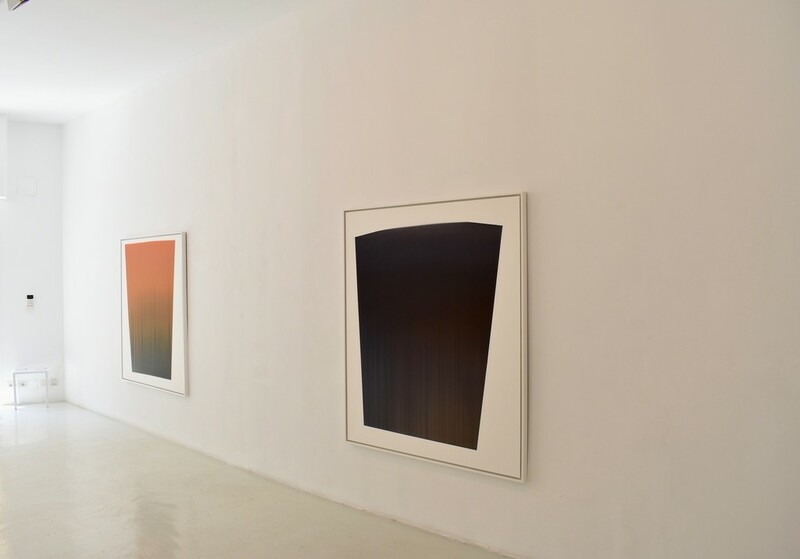 This way of working recalls the delicacy of artists such as Ellsworth Kelly or Blinky Palermo whose work gravitated around the subtleties of form and colour with a keen interest in perception and spacial relations. A quick look at Claire’s series will reveal how the similar shapes contain slight variations that makes each of them unique. In her case, it is of paramount importance the tension produced not only by the shapes themselves but also by the combination of both hard and soft hedges that decidedly influences the way the colours behave and manifest to us. The severity of such coloured shapes creates a form of threshold that overcomes the flatness of the surface and suggests the illusion of depth. To conclude, it only takes a few seconds to realise that there are absolutely no brushstrokes marks in any of Claire’s works —this is in fact a very peculiar trait as it confronts an eminently manual artistic practice such as hers with mechanical production processes like printmaking or photography. The result is a pristine and seemingly unmediated body of work where the artist vanishes among the layers of ink thus inviting the viewer to experience light and colour at their fullest.